By default, CubeBackup will backup all G Suite data in your domain, including Gmail, Google Drive, Google Calendar, Google Contacts and Google Sites. However, you can choose which Google Apps to include in your backup by simply clicking the button beside the app. Backup files shared with me: Google Drive files and folders can be shared among multiple users. Selecting this option ensures that all files shared with a user will be included in the backup and available to be restored. But please note that files that are shared among many users will be backed up separately for each user, potentially resulting in many duplicates of the same file in the backup. If this option is left unchecked, the file will only be be backed up under the owner’s account. By default, CubeBackup automatically backs up all new users, which greatly reduces the workload for G Suite administrators. However, some organizations require more fine-grained control. For example: a school might only want to backup data for new teachers, not for new students. CubeBackup allows you to control the backup for new users based on their Organization Units. 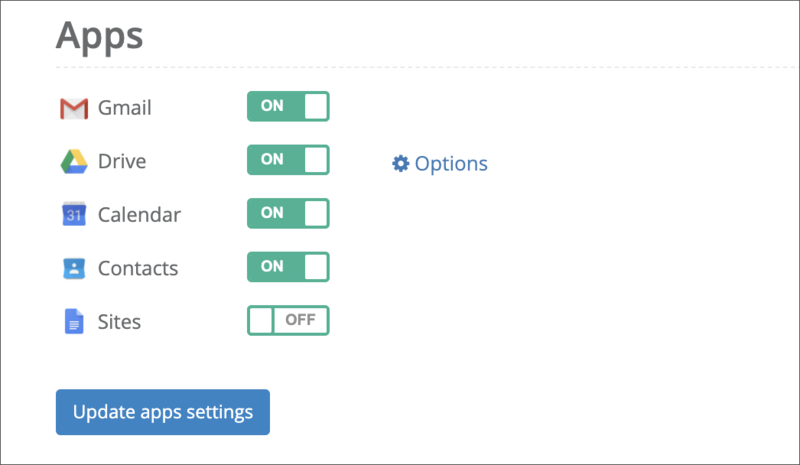 Click the advanced settings beside Automatically enable backups for new users, and check the corresponding OUs in the pop-up dialog. Number of days for historical versions to be preserved: Here you can set the retention period for historical backups. For example, if the retention period is set to 365 days: * Google Drive or Team Drive snapshots older than 365 days will be removed from the backup. * Gmail messages which were deleted more than 365 days ago will be removed from the backup. By default, CubeBackup will try to backup your G Suite data once each hour. You can change the backup interval in the System settings. In most cases, there is no need to change this setting - one hour is a reasonable interval for most G Suite domains. Please Note: * 1 hour is the smallest interval CubeBackup will allow. * New backups will not begin until the previous backup has finished. * There is no way to set the exact time for the start of the next backup. If you are worried about the network bandwidth consumption used by the backup process during office hours, please use the included throttling tools for CubeBackup. Instructions for other settings can be found in the initial configurations.